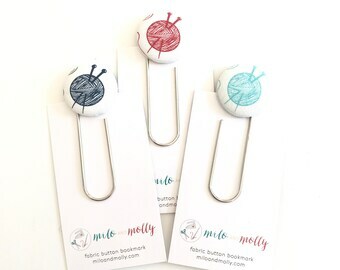 A fun and unique way to keep your place while reading your favorite book, this giant paperclip bookmark is sturdy enough to hold your pages while being both whimsical and functional. Additionally, you can use this for organizing papers or holding together receipts, coupons, and other small notes, or for any other paperclip-related use. 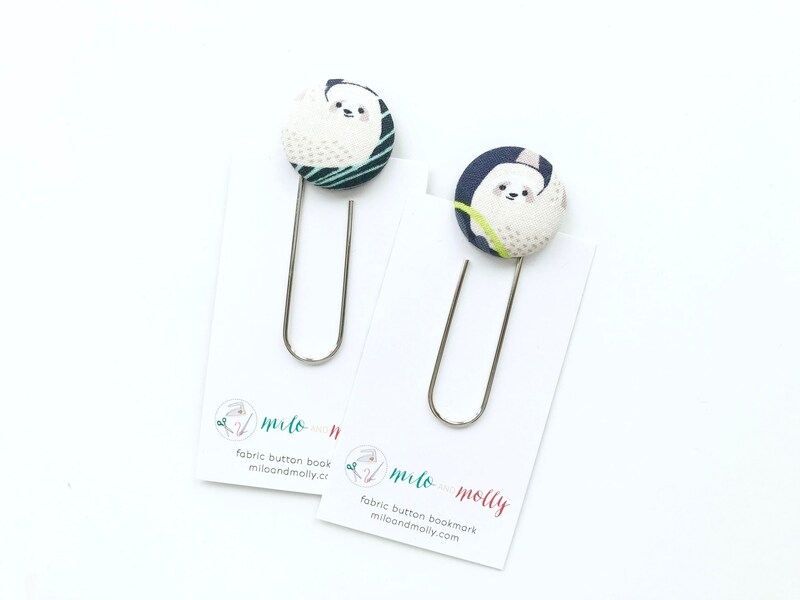 The paperclip measures 3 1/2 inches long and has a 1 1/8-inch diameter round fabric button attached to the top (about the size of a quarter), making the entire bookmark about 4 inches long. Want a different color or pattern? Want more than one? Feel free to contact me with questions or requests. These make great gifts for teachers and librarians, moms, dads, and high school graduates. This bookmark is ready to ship as shown. Visit my shop homepage here: http://miloandmolly.etsy.com. Jumbo Paperclip Bookmark. Pink and Purple Swirl. Teacher Gift for End of Year. Jumbo Paperclip Bookmark. Watermelon. Teacher Gift for End of Year. Jumbo Paperclip Bookmark. Scissors. Teacher Gift for End of Year. Jumbo Paperclip Bookmark. Foxes. Teacher Gift for End of Year. Jumbo Paperclip Bookmark. Cats. Teacher Gift for End of Year. Jumbo Paperclip Bookmark. Mod Flowers. Teacher Gift for End of Year. Jumbo Paperclip Bookmark. Music. Teacher Gift for End of Year. Jumbo Paperclip Bookmark. Mouse. Teacher Gift for End of Year. Jumbo Paperclip Bookmark. Unicorns. Teacher Gift for End of Year. Jumbo Paperclip Bookmark. Apples. Teacher Gift for End of Year. Jumbo Paperclip Bookmark. Coffee Mugs. Teacher Gift for End of Year. Jumbo Paperclip Bookmark. Pencils. Teacher Gift for End of Year.